Enjoy a relaxing stay and pure nature in our hotel. Let the sound of the wind in the trees lull you to sleep and let the birds gently wake you up in the morning. After a restful sleep in our hotel, our friendly staff will welcome you at our rich breakfast buffet. Start off a new day well rested and motivated. Our complex offers eight hotel rooms, which can be booked as single or double rooms. All rooms are equipped with a futon bed, shower or fully equipped bath, WC, loggia or balcony, landline phone, TV and other extras. Rooms are accessible by lift. 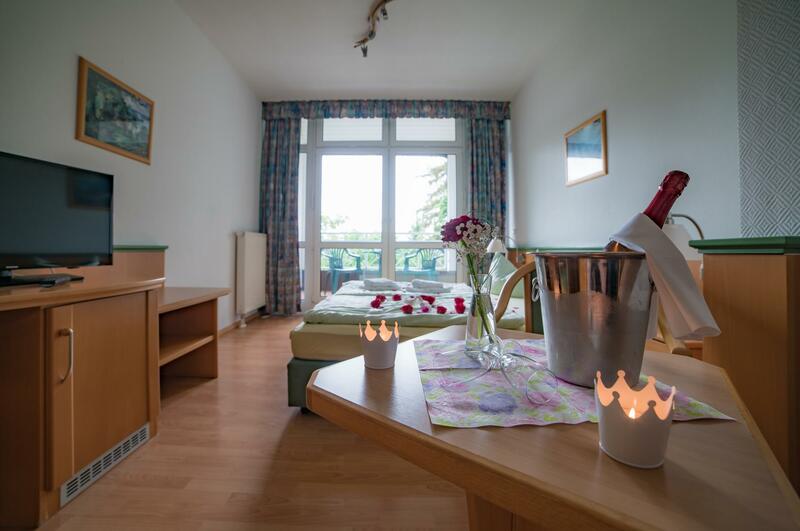 They are an addition to the apartments in our holiday resort and can also be booked in combination, i. e. if you arrive with children or friends. Prices from 76 € to 133 € per room and night. Minimum stay two days. Free Wi-Fi. Start the day feeling good thanks to our large breakfast buffet. Relax during your holiday and let yourself be enchanted by our wellness and cosmetic fairy. In order to ensure a relaxing wellness experience, please make an appointment prior to your arrival. Come and spend the afternoon at our spacious indoor swimming pool – including a waterfall, a whirlpool and saunas. Free wifi is available in our entire hotel, rooms, apartments and holiday homes.